JW Smart Services will only ever collect the information we need – including data that will be useful to help improve our services. Among the types of Personal Data that we collect, by itself or through third parties, there are; Cookies and Usage data, as well as data from quotation forms and contact form submissions through our website. Details of your visits to JW Smart Services website include but not limited to, IP addresses (the location of the computer on the internet), pages accessed, and files downloaded. This helps us to determine how many people use our site, how many people visit on a regular basis, and how popular our pages are. This is statistical data about our users’ browsing actions and patterns and does not identify any individual. It simply allows us to monitor and improve our service. JW Smart Services process the Data of Users in a proper manner and shall take appropriate security measures to prevent unauthorized access, disclosure, modification, or unauthorized destruction of the Data. The Data processing is carried out using computers and/or IT enabled tools, following organizational procedures and modes strictly related to the purposes indicated. Data may be accessible to certain types of persons in charge, involved with the operation of the site (administration, sales, marketing, legal, system administration) or external parties (such as third-party technical service providers, mail carriers, hosting providers, IT companies, communications agencies) appointed, if necessary, as Data Processors by the Owner. The updated list of these parties may be requested from JW Smart Services at any time. The Data is processed at the JW Smart Services operating offices and in any other places where the parties involved with the processing are located. 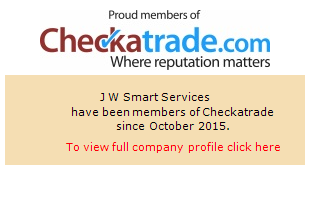 For further information, please contact us at sales@jwsmartservices.co.uk or on 01795 668000. The Data is kept for the time necessary to provide the service requested by the User, or stated by the purposes outlined in this document, and the User can always request that JW Smart Services suspend or remove the data. Our website quotation and contact forms collect your inputted data. The data is only used for your booking specifically. No personal data is shared or used by any other third parties. by writing to JW Smart Services, Smart House, Brielle Way, Sheerness, Kent. ME12 1YW. Information is stored by JW Smart Services on computers located in the UK.